Alonso was a guitar maker in Madrid circa the 1830s. Alfonso Benito was a master builder in the shop of José Ramirez II, and according to José Ramirez III, Alfonso and his father were his principle teachers. Pedro Alonso was a luthier active in Madrid around the middle of the eighteenth century. Agustín de Andrés was active in Madrid until thebeginning of the 20th century. Between 1903 and 1905 he had a workshop in Madrid on D. Manuel Fernández y Gonzalez. According to Romanillos (2002:18-19) in 1905 he was working with Manuel Rodríguez Pérez and Julián Gómez Ramírez. By 1908, like Julián Gómez Ramírez, he had moved to Paris where he had his shop on the Rue de Pateaux, No. 7. Photograph courtesy of Felix Manzanero. Vicente Arias was born in Alcazar de San Juan, Ciudad Real in 1833. He seems to have begun building guitars around 1860. Emilio Pujol relates that around 1878-1879, Arias was commissioned by Francisco Tarrega to make a small guitar for him that he could carry under his cape to use to strengthen his fingers out of sight. He continued making guitars right up until his death in 1912. He is generally credited with being the only luthier in the 19th century whose instruments rivaled those of Antonio de Torres in the elegance and constructional quality. Like many makers he had a series of shops. In 1889, he is recorded at Paloma 12. In trade guides 1898-1990, he is listed at Paloma 14. In 1903, we find him at Alamo 3, Madrid. Between 1908-09, his shop is listed on the calle Santa Isabel, no. 20. He 1910, we find him again at Alamo 3; in 1912 at Alamo 10. He died in 1914. Modesto Borreguero was born in 1893, and at age 12 entered the Manuel Ramirez shop on Calle Arlaban as an apprentice, working alongside of Santos Hernandez and Domingo Esteso, among others. Following the death of Manuel Ramirez in 1916, Borreguero was planning to open his own shop, and even had labels printed, but when his Manuel’s widow asked him to continue on, he did, along with Hernandez and Esteso. After a few years, Hernandez and Esteso left to open their own workshops, however, Borreguero continued working for Manuel’s widow until the shop closed around 1923. Even after, his labels touted the fact the had worked for Manuel Ramirez, Antiguo oficial de M. Ramirez. In 1924, Modesto married, and opened a workshop on Duque de Fernan Nuñez, No. 5. However, these were hard times, and during the civil war he lost his shop, and his wife died, leaving him with two children. Struggling on, he moved his shop several times. In 1945 he open a new workshop on Zurita 27 where he worked until 1948, and began to gain a reputation as a luthier. In 1948, he rented space in the workshop of Hernandez and Aguado, who were furniture restorers at the time, at Ribera de Curitdores No 9. Inspired by watching Borreguero build guitars, they too began building guitars. In 1952, Borreguero moved his workshop to Desengaño No 4, and began to build exclusively for the music store Casa Garrido. There he also took on the training of Vicente Perez Camacho, who went on to become a noted luthier. He also taught a young Felix Manzanero how to French polish, a skill that allowed Manzanero to enter Jose Ramirez III workshop as an apprentice. Felix remember’s him as being “somewhat of a bohemian” and being “a generous man, who enjoyed drinking, and so was often broke.” His son Enrique Borreguero (b. 1925) also went to work for Ramirez. Modesto Borreguero retired in 1963, and died in 1969. Agustín Campo was an important luthier in Madrid circa 1840. He collaborated with the guitarist/composer Dionisio Aguado in making improvements to the design of his guitars that were taken up by other members of the Madrid school. Benito Campo was born in Logroñom La Rioja in 1798. He seems to have worked sometimes as a carpenter, but was also guitar maker with a shop on Majaderitos, 16. He married the daughter of Manuel Muñoa in 1827. He was a trusted friend of Dionisio Aguado, who named him in 1849 to be the executor of his will. He trained one son José Toribio Campo. Photo courtesy of Spanish Guitar Shop. Rafael Casana apprenticed under José Ramirez I. He latter settled in Córdoba where he seems to have trainedMiguel Rodriguez. Rafael, however, was apparently an unstable man, and according to Ivor Mairants, ended up committing suicide in 1905. Faustino Conde Salamana was born in Villalba de los Alcores in 1913. He began his apprenticeship with his uncle, Domingo Esteso Lopez (1882-1937), when he was only 13. When Domingo Esteso died in 1937, Faustino and his brothers Mariano and Julio Conde took over their uncle's workshop in Madrid, continuing to work for their uncle's widow until her death in 1960 building under the label Vda Sobrinos de Esteso (Widow and nephews of Domingo Esteso). The Conde brothers continued building under the label Sobrinos de Domingo Esteso into the 1970s when they took the name Hermanos Conde (the Conde Brothers). Faustino died in 1988. The original Esteso-Conde shop currently is run by Faustino's widow, Julia Conde Pastor. Julio Conde was one of the Conde brothers, and nephews and successors of Domingo Esteso. He died in 1995. Mariano Conde, a nephew of Domingo Esteso, and one of the Conde brothers who worked for Domingo's widow, and after her death in 1960, inherited the Esteso workshop. He later left and set up his own workshop. He died in 1989. Born in Madrid in 1926, Contreras began his working life as a cabinet maker, and reportedly even tried his hand as a bullfighter. In 1959, he joined the Ramirez workshop as a senior journeyman. It was Contreras who made the first José Ramirez guitar Andrés Segovia bought in 1960. After three years with Ramirez, Manuel opened his own guitar workshop in the center of Madrid. He soon earned a reputation as one of the finest and most innovative luthiers in Spain. Among his innovations is the “double top,” a guitar in which a second top is mounted between the braces of the back, improving boththe tone and the volume of the guitar. In 1983, Contreras designed a radically different guitar without an upper waist or sound hole for the Uruguayan guitarist, Abel Carlevaro. The assumption being that by enlarging the surface area of the top, the volume and tone would improve. 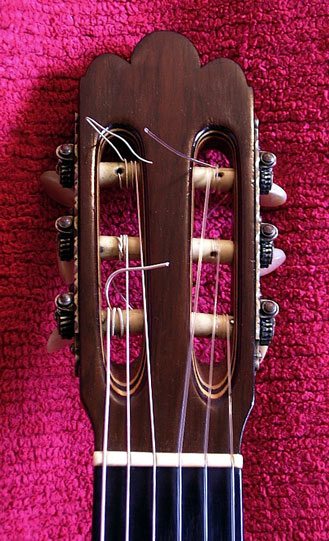 The guitar has also an extra back and sides inside body to isolate the box from the damping effect of the player's body. Instead of a sound hole, there are slits that around the edge of the top, between the sets of sides through which the sound emerges. I have played this model in his shop, and indeed it has better volume and tone, but is a very heavy instrument. His most popular models, however, are built in the Spanish tradition. They are large, long scale instruments, with fan braced tops, based on the successful Ramirez formula. Contreras died in 1994 of cancer, but his shop continues to build the same models under the direction of his son, Pablo Contreras. Juan de Carrión was a luthier to the Spanish Crown in Madrid at the beginning of the 17th century. Domingo Esteso Lopez was born in San Clemente in the province of Cuenca in 1882. He was one the guitar great makers of the early 20th century based in Madrid. In the 1890s, he began as an apprentice in the shop of Manuel Ramirez, working along side such greats as Santos Hernandez and Modesto Borreguero. When Manuel Ramirez died in 1916, he continued to work for Manuel's widow for about a year. In 1917 he opened his own shop on the calle Gravina, where he was joined by his nephew, Faustino Conde in 1926. After his death in 1937, Faustino and his two brothers, Mariano and Julio, took over the shop, building under Vda y Sobrinos de Domingo Esteso (Widow and nephews of Domingo Esteso. Following the widow's death in the 1960s, they became Hermanos Conde, sobrinos (nephews) of Domingo Esteso. Antonio Carlos Garcia was a maker of guitars and bandurrias active in Madrid circa 1860. The parlor guitar shown was made for the English market where according to its label the Alban Voigt & Co. was Garcia's exclusive distributor in Great Britain and the colonies. This guitar has a three piece top, back and sides of Rosewood from Brazil. Mother-of-pearl is inlayed into ebony of the rosette. The construction of this small instrument (590mm scale), is unusual in that it makes no use of fan bracing. Despite this, its tone and volume are surprisingly big. Juan Garcia (Madrid active c. 1860s - 1910s. )Enrique Garcia was born in Madrid in 1868. Although he was the son of a guitar maker, Juan Garcia, in 1883 he began an apprenticeship with Manuel Ramirez, and continued to work for him for many years. In 1893, his guitars won first prize at the Chicago World Fair. In 1895, he left the Ramirez shop and moved to Barcelona where he opened a workshop on the calle Aragon No. 309. In 1899, he moved his shop to the calle Aragon No. 455. In 1902, he again moved his shop to its ultimate location on the Paseo de San Juan No 110. Enrique Garcia quickly gained an international reputation, and his guitars were particularly in demand in Latin America. By 1912, he was shipping most of his guitars to Latin America. In Barcelona, he had one disciple Francisco Simplicio. Garcia made some guitars that so closely resembled those of Antonio de Torres that their labels have been removed and passed off as Torres guitars. He died on October, 31, 1922. Juan Garcia was a luthier active in Madrid in the later half of the 19th century, and father of Enrique Garcia, and gave his son his initial training. He died in 1914. Antonio Gómez Rodriguez was a luthier in Madrid active circa 1930. Julian Gómez Ramirez was born in Madrid in 1879. About 1892, he began an apprenticeship with Agustín Andrés. By 1910, however, he was working as a journeyman in the shop of José Ramirez I. Althoughnot related to Ramirez, the Ramirez family claims him as a disciple of Ramirez I. According to Robert Bouchet, Julian told him he had worked for Manuel Ramirez before coming to Paris around 1914. He remained in Paris until his death in 1943. Julian Gómez Ramirez was befriended by Robert Bouchet (1898-1986), and was a frequent visitor in Julian's tiny, dark and jumbled workshop, and credits Julian with inspiring him to become a guitar maker. Despite the working conditions in his shop, Julian Gomez Ramirez produced guitars of genuine quality. Among the players who owned his guitars was the concert guitarist Ida Presti (1924-1967). Photo of Julian Gómez Ramirez with permission of James Westbrook "Guitars Through the Ages: Craftsman to Performer, 2002"
Francisco González Estéve, born inCórgomo, Orense in 1820, was an engineer who took up guitar making. In fact, he is credited with makingthe first car in Spain. Made before the internal combustion engine, it was a lever operated vehicle. He is also generally given the honor of being the founder of the Madrid school, this despite the fact that he was not a native of Madrid, but had moved there in 1835 or 1836. Nor was he the first, guitar maker in Madrid. There was already a flourishing Madrid schooldeveloping. The honor certainly is appropriate for being the most influential, for he trained José Ramirez I, who in turn taught his brother, Manuel Ramirez, and it is two these two brothers that almost every maker in Madrid traces his lineage. Francisco, however, was also recognized in his own time as a fine maker. In 1867, atthe Universal Exposition in Paris, he was awarded a bronze metal for his guitars. He had a series of shops. From around 1849-1855, he was at Calle de los Estudios de San Isidro. He then moved to Calle Toledo, 40. In 1863, he was at Calle Latonerones, 1. By 1864, he on the calle Carrera de San Geronimo, No. 15, near the Puerta de Sol, the shop he continued to occupy until his death in 1879. His son-in-law, Enrique Romano Papell took over the shop when he died. Photograph courtesy of Felix Manzanero. Marcos Antonio González(Madrid, b.c. 1736, active c. 1760s-1800s d.1809). Marcos Antonio González was a guitar maker who settled in Madrid in 1766 on the Calle Majaderistos. He trained trained his son, Manuel Narciso González. He also trained the brothers Juan and Manuel Muñoa. Manuel married his daughter and eventually took over the workshop. He had his workshop on the Calle Angosta de Majaderitos. Manuel Narciso González was born in Madrid in 1781. He was trained by his father, Marcos Antonio González, and was a brother-in-law of the Juan and Manuel Muñoa. When his father died, Manuel took over his father's workshop on Calle de Majaderitos. He was appointed a the guitar maker to the Royal Chamber in 1830-- a fact recorded on the label of his guitars thereafter. Manuel Hernández was born in 1895 in a village near Toledo, but his family moved to Madrid when he was eight years old. At the age of 14 he began to work as an apprentice in a piano workshop where soon after he was allowed to work in the area where the main bodies of the piano were constructed, and the attendant acoustic problems solved. Victoriano Aguado was born in 1897 in the city of Madrid. He also grew up in Madrid and was employed as a French polisher at the same piano workshop. There, the two became friends and when the business closed in 1941, they decided to set up a workshop which would specialize in the restoration of pianos and antique furniture. Aguado was an enthusiastic guitarist and Hernández had a love for music combined with his skilled craftsmanship which eventually led to collaboratively making a couple of guitars. They were inspired by the guitar professor Sainz de la Mata at the Conservatorio de Madrid and they learned much by watching Modesto Borreguero at work - he was once a pupil of Manuel Ramirez. After favorable response to their instruments they decided to convert the entire workshop over to guitar production. By the end of their first year as full-time luthiers, they had a waiting list of seventy customers. By 1975 when Hernández died, over 400 guitars had been produced. Although Aguado retired from guitar-making in 1970, the post 1970 guitars were made by Hernández and his son-in-law, Jesus Belezar. The tradition of guitar construction so firmly established in Spain during the last 100 years has been maintained there by a number of modern master makers including Hernández y Aguado. Their partnership is considered one of the most successful in guitar-making history. Santos Hernández Rodríguez (Madrid, 1873-1943). Francisco Ibarrola (Madrid, active c. 1900-1910s). Francisco Ibarrola was a luthier in Madrid active at the beginning of the twentieth century. In 1914, he had a shop on the calle Santa Barbara. Pedro Jiménez, a luthier in Madrid in the early part of the twentieth century had a shop on the calle General Ricardo. In 1918, he moved his shop to the calle Mayor. Julián Llorente was born in Pozuelo de Alarcón, Madrid in 1827. He first appears in the records as a guitar maker in 1851 with a shop on the calle de Jocometrezo, No 70. In 1861, he moved his shop to calle del Bastero, No. 9 where he remained for many years. By 1890, however, he had moved to calle Mediodia Grande, No. 19. His guitars show that he was a skilled enough luthier that the famous guitarist Miguel Llobet (1878-1938) owned a Julián Llorente made in 1880 which he left to Daniel Fortea (1878-1953). Cleto López was a guitar maker active in Madrid in the late nineteenth century. (Photograph courtesy of Felix Manzanero). Josef Martinez was a luthier active in Madrid at the beginning of the 19th century. An example of his work is in the collection of Felix Manzanero, and according to Manzanero is among the best sounding guitars in his collection. (Photograph courtesy of Felix Manzanero). Juan Manuel Martinez de Milan was active in Madrid in the 1950s. The guitar shown here was made in 1952. The label which sports his picture reads J. Manuel Martinez de Milan / Constructor de Guitarras / Rodas 11, Interior 13. Telefono 2810?? / Madrid / No. ?5 [handwritten] Año 1952 [penned in]. (Photograph courtesy of Felix Manzanero). Juan Moreno (Madrid, b. 1792 active 1820s-1830s d. 1836). Juan Moreno was born in Madrid in 1792, by the 1820s he had established himself as a guitar maker with a shop on Calle Ancha de Majaderitos, 10. He escaped doing military service because he had poor vision in his right eye. In 1829, Juan built a guitar which according to Dionisio Aguado, led the movement which changed guitar construction in Madrid from the French style transverse bracing and fingerboard flush with the top, to a Spanish system using fan bracing and a raised fingerboard. He died, unmarried, in 1836. Antonio Muñoa was a luthier in Madrid active circa 1820. The nephew of Juan Muñoa, Antonio was trained by his uncle. Dionisio Aguado praised his work in his Method (1820) saying that the few guitars he has made show promise of his developing his uncle's abilities. Juan Muñoa was born in Pradoluengo in 1783, and like his elder brother probably learned guitar making with Marcos Antonio González. Manuel and Juan later moved to Madrid, and they were active at the end of the eighteenth and beginning of the nineteenth century in Madrid. Juan died in Madrid in 1824. Juan Muñoa made a guitar for Dionisio Aguado that this guitarist and composer praises in his Colección de Estudios (1820) as being the optimal guitar. Juan Muñoa II appears to be a son or grandson of Juan Muñoa active in Madrid in the mid-19th century. An example of his work dated 1870 is in the collection of Felix Manzanero. (Photograph courtesy of Felix Manzanero). Manuel Muñoa was born in Pradoluengo in 1779, and probably learned guitar making with Marcos Antonio González. He move to Madrid with his brother, Juan Muñoa, and they were active at the end of the eighteenth and beginning of the nineteenth century in Madrid. Manuel died in Madrid in 1815. He had his shop on the calle Majaderitos. José Nieto was a luthier active in Madrid at the toward of the nineteenth century. Asencio Ortega was the son of Silverio Ortega, a luthier. Although trained by his father, he wasn't the luthier his father was. Asencio was best know for his violins, but also built some guitars. Mariano Ortega (Madrid, b. 1790 d. 1865). Mariano Ortega was the son of Silverio Ortega, a luthier. Mariano was trained by his father, but wasn't the luthier his father was. Nevertheless, he built both violins and guitars, and had a long active career in Madrid. Silverio Ortega was a luthier in Madrid in the second half of the eighteenth century. He was born in Orusco in the province of Madrid in 1765 and apprenticed as a luthier with his uncle Vicente Assensio, a priest. He built and repaired instruments for the Royal household and Royal chapel from 1782 until his death in 1846. He was the father of Mariano Ortega, and trained his son. Serafín Pec was a guitar maker in Madrid active at the end of the nineteenth century. An example of his guitars is in the collection of Felix Manzanero. (Photograph courtesy of Felix Manzanero). José Ramirez Planell wasborn in Madrid in 1858. His father was a master carpenter who worked for a developer in the Salamanca district of Madrid. When he was just 12, he was apprenticed to Francisco González (1818c-1880c). From all accounts, it was a long and arduous apprenticeship that began with menial tasks, but slowly as these were mastered progressed to more complex ones, until the responsibility for complete instruments was given him. In 1882, José opened his own workshop in the Rastro ofMadrid, on Cava Baja-- a street that runs along what was the moot around the old city, and in 1890 moved toConcepcion Jerónimo 2where the Ramirez shop remained for over a hundred years. In 1897, José Ramirez was awarded a gold medal for his guitars at the Logroño exposition. Like his teacher, José specialized in large, shallow flamenco guitars with arched tops. José not only trained included brother Manuel Ramirez Planell (1864-1916), but Julian Gomez Ramirez who later practiced his art in Paris, Antonio Viudez who migrated to Buenos Aires, and Rafael Casana. The Jose Ramirez III also claims that he taught Enrique Garcia. José Ramirez, of course, also trained his son, José Ramirez II (1885-1957), who took over the business after his father's death. He died in 1923. (Photograph courtesy of Felix Manzanero). José Ramirez de Galarretawas born in 1885 in Madrid. At a tender age he began his apprenticeship with his father, also learning to play the guitar. Against his father's wishes, when he was twenty he joined a folk troop for a Latin American tour as a guitarist, going by the name Simón Ramirez. After visiting Argentina, Chile, and Uruguay, he decided not to return to Spain, but to remain in Buenos Aires. There he married, and there his first son, José Ramirez III, was born. It was not until two years after his father's death in 1923 that José IIreturned to Spain to take over the family business. He soon established himself as a master luthier. In 1929 his guitars were awarded a gold medal at the Latin American Trade Fair in Seville-- a fact that he soon incorporated into his label. During his long career, José Ramirez II trained not only and his own son, José Ramirez III, but Marcelo Barbero (1904-1955). He died in 1957. José Ramirez IIIwas born in Buenos Aires, Argentina in 1922, and was only three when his father returned to Spain to take over the workshop on Concepción Jerónimo 2 in Madrid. Apprenticing with his father, through the difficult times of the world depression and Spain Civil War, José III soon proved to be a tireless investigator of the instrument, and an able business man. Under his supervision, the workshop grew not only into a major enterprise, butJosé III recruited and trained a host of apprentices--many of whom worked in his shop for years, and many of whom have since become famous luthiers in their own right: Paulino Bernabé, Felix Manzanero, Manuel Contreras, Manuel Rodriguez, Ignacio M. Rozas, Manuel Caceras, Miguel Malo Martinez, José Romero, and José Ramirez IV to name but a few. José Ramirez III is also generally credited with the introduction of cedar as a tone wood. During the 1960s, as high quality German spruce became hard to find, and increasingly expensive, José III discovered and promoted western red cedar by building his both his 1a and 2a models with cedar tops, and by convincing great artists to use them. When Segovia began playing a Ramirez in the 1960s, it became the guitar that every aspiring guitarist wanted. Manuel Ramirez was born in Alhama de Aragón in the province of Zaragosa in 1864. His father, Jose Ramirez de Galarreta, was a master carpenter who worked for a developer in the Salamanca district of Madrid. His brother José apprenticed with Francisco Gonzalez and then taught his younger brother, Manuel. Around 1890, Manuel decided to go out on his own. Initially, he thought of emigrating to Paris as had José's pupil, Julian Gomez Ramirez (no relation). His brother José helped him make preparations, but instead he soon opened a workshop on the Plaza de Santa Ana. José felt betrayed, and the rift this caused was so deep that they never spoke again. Business, however, was slow and so Manuel always somewhat of a restless Bohemian character, he also worked for a time as an electrician for the Madrid Electric Company, leaving his shop in the hands of his disciple, Enrique Garcia. In 1897, Manuel moved his shop to the Calle Arlabán, No. 10 where he remained until 1912, moving then to No. 11. Manuel who also made violins became an official Luthier of the Royal Conservatory of Madrid. He also won a medal at the Chicago Fair in 1893 for his work. Manuel trained a generation of great luthiers: Enrique Garcia, Santos Hernandez, Modesto Borreguero, and Domingo Esteso. 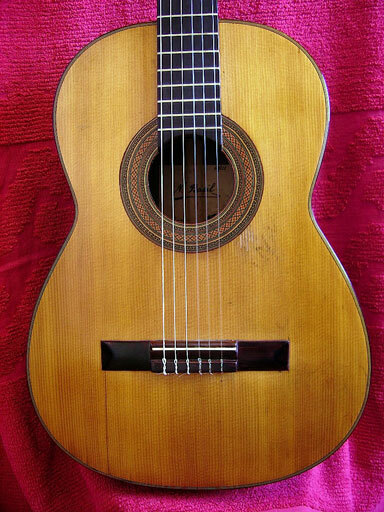 Manuel is also remembered for his gift of a fabulous guitar to a young Andrés Segovia in 1912. Manuel Ramirez died in 1916, and his shop was taken over and run by his widow. Out loyalty to Manuel, Santos Hernandez and Domingo Esteso continued to work for his widow her until her death in 1921. Francisco Rey was a guitar maker active in Madrid during the nineteenth century. Manuel Rodriguez Perez was born in San Fernando Island Cadiz in March 4, 1887. His father, Manuel Rodriguez Marequi, was a flamenco guitarist. In 1905, Manuel apprenticed with Agustin Andres in Madrid. Around 1908, his father took the family to live in Paris, and where Manuel found work with Julian Gomez Ramirez, remaining there until the start of the war in 1914. Returning to Madrid, he went to work for Jose Ramirez I, as a varnisher. After Ramirez I died, his son took over the shop, and Manuel continued to work for Ramirez II, until he was replaced by a varnisher from Valencia in 1930. Between 1930 and 1939, Manuel varnished for Santos Hernandez, Saturnino Rojas, and Modesto Borreguero. In 1939, he was rehired by Ramirez II, bring with him his 13 year old son, Manuel Rodriguez Fernandez, as an apprentice. Manuel continued to work for Ramirez until he retired in 1953. Manuel Rodriguez Fernandez (born 1926) was the son of Manuel Rodriguez Perez. He began his career at age 13 when his father, returned to work for Jose Ramirez II after the civil war. Rising through the ranks at Ramirez, Manuel soon became a master craftsman. In 1955, he established his own workshop in Madrid. In 1959 he decide to move to Los Angeles, where he opened a shop on Willshire Boulvard, and rapidly established a wide following. There his two sons, Manuel Rodriguez Moreno and Norman were born in 1962 and 1965 respectively. In 1973 the family moved back to Madrid, and established a shop. Manuel continued to build fine handmade guitars, but to serve the growing demand for high quality student instruments, in 1991 he established a factory that soon earned an international reputation. His sons, followed him into the family business, both becoming outstanding luthiers in their own right. Although Manuel died December 25, 2008, he left his company in his sons' capable hands. Saturnino Rojas (Madrid, b. 1859-d. 1937 active 1880-1935). Saturnino Rojas was a guitar maker in Madrid in the second half of the nineteenth century and early part of the twentieth century. He was a contemporary of F. Gonzalez, Ramirez, Santos Hernandez, and Domingo Esteso, and seems to have been an accomplished luthier of guitars, bandurrias, and laúdes. According to the Madrid guitar maker Manuel Rodriguez Sr, who was a good friend, Saturnino opened his shop on the calle Atocha no. 115 well before 1890, and was the first teacher of Santos Hernandez. He never married, but instead lived in a flat above his workshop with his sister. When he retired in 1936, Marcelo Barbero and Manuel Rodriguez negotiated with him for his workshop, but nothing came of it, he died in 1937. (Photograph courtesy of Felix Manzanero). Emilio Fernández was a luthier active in Zaragoza circa 1930 who built guitars and bandurrias. Pedro Fuentes a maker from Zaragoza seems to have switched from the typical fair of the first half of the nineteenth century, to guitars that were clearly inspired by Torres. He was appointed a guitar maker to the Royal Chamber in 1858 and in 1860 presented a highly ornate guitar to the prince. Basilio Marin Ferrer was a guitar maker active in Zaragoza around the turn of the twentieth century. His shop was located on the calle Manifestación, No. 62. He primarily made modest, affordable instruments.